The Canon MG7150 is a good all-rounder which will be particularly appealing to those wanting to print lots of photographs. For those looking for a photo printer which also has a scanner, the Canon Pixma series has often been a go-to choice for many. The MG7150 has lots of appealing factors for those who want to print images which are up to A4 in size. It uses a system of six single inks, which although makes for a larger initial outlay than an all-in-one colour ink system, means that you only replace the ink cartridges that are necessary, rather than throwing out an entire cartridge which may still have quite a lot of one colour left. You also have the option to purchase 'XL' ink cartridges, which Canon promises delivers savings of up to 30% per page. As this is a dedicated photo printer, the six ink system may also be appealing as it has grey for richer colour shots and monochrome prints. 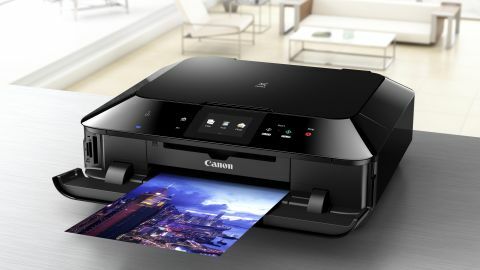 Unlike many printers, the inks which come delivered with the printer are at 110% capacity, as Canon says that some ink will be wasted in the setup and calibration of the printer. This should allow you to get a decent set of prints before you need to purchase your first replacement inks. On the front of the printer is a full-colour touch panel, which allows you to navigate through different menus and printer options. The 'buttons' on the printer – such as the on/off button – are also touch sensitive, and not raised, physical buttons. Canon claims some pretty swift speeds for the MG7150. It says that a borderless print of 10x15cm (7x5 inches) can be made in approximately 21 seconds. Prints of up to 9600 x 2400 dpi print resolution can be made. The MG7150 is a wireless printer, and is also equipped with AirPrint for Apple devices. This means you can print directly from your iPhone or iPad without needing to go through a specialist app. While you can print from Android phones and tablets, you will need to download an app from the Google Play store. You can also print wirelessly from your computer. Photographers will also likely appreciate the dedicated memory card slots - there's SD, Memory Stick Duo and Compact Flash format slots available. This means that you can remove the card from your camera and print directly from the device, bypassing the need for a computer altogether. There are two trays for the MG7150 which allows you to insert different paper sizes. Unlike some other photographic printers there is only one A4 tray, which means that you will need to swap between photo paper and ordinary paper depending on the job you wish to do. The second tray is for photographic print sizes 6x4 and 7x5 inches. This is useful if you want to make quick prints ready for small frames. A scanner is included within the printer too. This has a resolution of 2400 x 4800 dpi and can scan an A4 document in approximately 14 seconds. You can also use the scanner to make copies, again bypassing the need for a computer attachment altogether if you prefer. You can save scanned documents / images to an inserted memory card or have the printer email it to you. While this printer is more expensive than a lot of budget two-in-one devices, in terms of dedicated photographic printers, it's very reasonably priced, so it's likely that lots of serious amateurs and enthusiasts will be tempted by the MG7150. Hopefully the print quality will match that which we expect from Canon's range.